Raila Odinga’s in Kibera Nairobi celebrate the Supreme Court ruling nullifying Uhuru Kenyatta’s election. Agencies picture. NAIROBI–Both Kenyan President Uhuru Kenyatta and his opponent NASA leader Raila Odinga said Friday they are ready for fresh elections involving all candidates. This follows a Supreme Court ruling yesterday that nullified President Kenyatta’s reelection citing irregularities and illegalities. It ordered a new presidential vote within 60 days. The precedent-setting dramatic ruling marks the first time an African court has nullified the election of a sitting president. The ruling was hailed in some quarters as a demonstration of judicial independence and a maturing democracy while critics said it perverted the people’s will. The reversal of Uhuru’s 54 percent win stunned many, including investors at the Nairobi Securities Exchange, which briefly halted trading after blue-chip shares plummeted. Following the judgment, the court broke into cheers and songs, with Raila punching the air with his fist. The court area and potential hotspots were bristling with security personnel but there was no violence. There was wild rejoining in opposition strongholds while dismay and disbelief filled Uhuru’s Jubilee Party turf. On August 11, Uhuru had been declared winner with 8.2 million votes to Raila’s 6.7 million. The former Prime Minister filed a Supreme Court petition, challenging the win, calling the election rigged. NASA’s Raila Odinga had asked Kenya’s electoral body to declare him winner. Courtesy photo. Raila called IEBC commissioners and top officials criminals, adding that they should be imprisoned and a neutral team named to conduct new polls. They argue IEBC boss Wafula Chebukati, all commissioners and CEO Ezra Chiloba have been found guilty of misconduct by the Supreme Court, falling short of Chapter 6 of the Constitution. “A declaration a person has been mismanaging the presidential election, and in particular the 1st to 8th respondents, shall not qualify to hold a public/state office,” the petition says. IEBC chair Chebukati, Chiloba and six commissioners have been named as respondents. President Uhuru, meanwhile, said he disagreed with the ruling, adding that six judges could not speak for the Kenyan people. But he said he respected the ruling and called for calm. Jubilee holdslarge majorities in the National Assembly, Senate, Council of Governors and some county assemblies. He said JP would campaign on the same pro-development manifesto. Jubilee candidate Uhuru Kenyatta addresses a rally. Kenyatta says he is ready to battle again. Courtesy photo. The 4-2 ruling of the David Maraga-led court (one justice was absent and hospitalised) was delivered under tight security. Raila, 72, alleged widespread fraud in the election, transmission tampering and attempts to hack the supposedly impregnable computer systems. “Having considered evidence by a majority decision, Articles 10, 38, 81 and 86 of the Constitution and Sections 39 ( 1 ),44 (a) and 83 of the Elections Act, the first respondent (IEBC) failed, neglected or refused to conduct the elections in a manner and the dictates of the Constitution,” the four judges said. The majority are Justices Maraga, Philomena Mwilu, Smokin Wanjala and Isaac Lenaola. Judge Mohammed Ibrahim was admitted in hospital. Two judges — Njoki Ndung’u and Jackton Ojwang’ — dissented and dismissed Raila’s petition in totality. They read brief statements in court. Raila will feel vindicated against accusations he was a bad loser. The decision is a massive indictment of the new electoral commission — which replaced the previous body that the opposition sent packing over allegations of vote rigging in 2013. NASA now wants a new team to manage the presidential rerun in 60 days. The verdict also damages the credibility of international and some local election observers who profusely praised the election, especially Election Day, as free, fair and credible. They did not look closely at issues NASA raised and generally told Raila to move on. People will be watching for the reaction of former US Secretary of State John Kerry whose positive assessment was used in court. He headed the observer mission for the Carter Center. Regardless of winners and losers, it was a proud moment for Kenya, which has suffered post-election violence. The debate on the validity of the election was conducted in court, not in the street. Though the four judges found no wrongdoing by Uhuru, the decision casts doubt on the Independent Electoral and Boundaries Commission’s fidelity to the law. 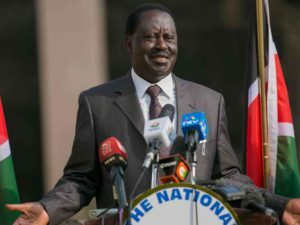 Raila said outside the courthouse, “This is indeed a very historic day for the people of Kenya and by extension to the people of the continent of Africa. Kenyatta’s lawyer Ahmednassir Abdullahi said the decision had been “very political” but had to be respected. Opposition supporters celebrated outside court and in opposition strongholds. 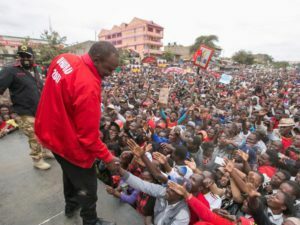 The announcement on August 11 of Uhuru’s victory sparked days of sporadic protests in which at least 12 people were killed. Devolution CS Mwangi Kiunjuri said the ruling only strengthened Jubilee’s resolve, saying they won fair and square and will do so again. On Friday, the Law Society of Kenya, as a friend of the court, said Maraga’s directions were clear. Murang’a Senator Irungu Kang’ata said Jubilee has a majority in Parliament.